PANAJI: Goa Chief Minister and former Defence Minister Manohar Parrikar died in Panaji on Sunday after suffering from a prolonged illness. He was 63. The senior BJP leader had been undergoing treatment for pancreatic ailment in hospitals in New York, Goa, Mumbai and Delhi since February 2018. A condolence meet will be held in the Union Cabinet at 11 am on Monday. President Ram Nath Kovind has expressed deep shock over the death of Goa Chief Minister Manohar Parrikar and said, “Extremely sorry to hear of the passing of Shri Manohar Parrikar, Chief Minister of Goa, after an illness borne with fortitude and dignity. An epitome of integrity and dedication in public life, his service to the people of Goa and of India will not be forgotten #PresidentKovind,” tweeted President Kovind. BJP President Amit Shah termed Parrikar’s death as a huge loss for nation and remembered his commitment for the welfare of people. “Manohar Parrikar ji’s demise is extremely painful. In him, the nation has lost a true patriot who selflessely dedicated his entire life to the country and ideology. Parrikar ji’s commitment towards his people and duties was exemplary,” he tweeted. Congress President Rahul Gandhi has also expressed deep sadness over the demise of Parrikar and called him one of Goa’s favourite sons. “I am deeply saddened by the news of the passing of Goa CM, Shri Manohar Parrikar Ji, who bravely battled a debilitating illness for over a year. Respected and admired across party lines, he was one of Goa’s favourite sons. My condolences to his family in this time of grief,” tweeted Rahul Gandhi. Defence Minister Nirmala Sitharaman also offered her condolence and said that Shri Manohar Parrikar was a sincere, honest and sensitive political activist. “Shri Manohar Parrikar is no more. A sincere, honest & sensitive political activist. Was simple and down to earth, I learnt a lot from Shri.Parrikar. As Raksha Mantri his contribution to making the armed forces a modernised, lean & mean fighting machine will remain unparalleled,” she tweeted. Home Minister Rajnath has expressed deep shock and pain over the demise of Parrikar. He remembered him as an honest leader who was known for his simplicity. “Deeply saddened and pained by the demise of my dear friend & Chief Minister of Goa, Shri Manohar Parrikar. He was known for his honesty, integrity and simplicity. He served the nation and the state of Goa with great diligence. My heartfelt condolences to his bereaved family,” tweeted Singh. Finance Minister Jaitley has expressed pain over the demise of Parrikar and said that he will be missed by everyone. “Saddened to know about the demise of senior BJP leader Shri Manohar Parrikar ji, Chief Minister of Goa. He always led by example in his public life & was loved by masses. He will be missed by everyone of us. May God render peace to the departed soul. Om Shanti ॐ शान्ति,” tweeted Jaitley. 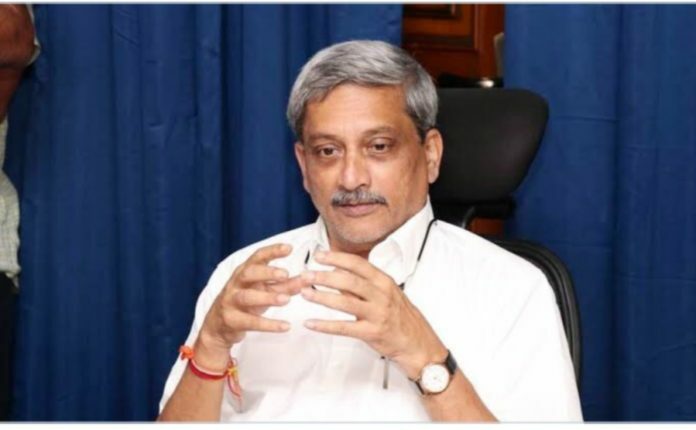 Defence Ministry has conveyed deep condolences on demise of Manohar Parrikar. “@DefenceMinIndia conveys deep condolences on demise of former RM, Mr @manoharparrikar. With hallmarks of strong & decisive leadership, Mr Manohar Parrikar will be missed by whole of the def establishment. Mr Parrikar was at the helm in defence of the Nation from 2014 to 2017,” tweeted the Defence Ministry spokesperson. Delhi Chief Minister Arvind Kejriwal paid his tribute to Parrikar and said that he was a symbol of simplicity. “Extremely saddened at the news of passing away of Goa CM Sh Manohar Parrikar ji. A symbol of simplicity in politics who led a humble life is no longer with us. May his family bear the irreparable loss with courage. Prayers with them,” tweeted Kejriwal. BJP leader and Union Minister Smriti Irani posted an emotional tweet remebering Parrikar. “A leader, a mentor, a friend- Parrikar Sir meant all that & more to my family. But then every Goan can say the same for that was the persona of Manohar Parrikar. He taught me dignity in the face of adversity, loyalty in tough times & perseverance so that determined goals are met,” Irani said. Congress leader Mallikarjun Kharge remembered Parrikar as a good human being and said that his demise has left a big void in Indian politics. “He (Goa CM Manohar Parrikar) was a good human being. His passing away has left a huge gap in politics; we have lost a good politician. His demise has caused us immense grief. I express my grief and I pay my tributes on behalf of my party and myself,” Kharge told ANI.